To honor one of our favorite teams, we created a hot dog fit for a champion! For blue cheese sauce, place 1/2 cup blue cheese crumbles and vinegar in a small bowl and with a fork mash until a smooth consistency. Stir in mayonnaise, yogurt (or sour cream), Worcestershire sauce, and black pepper. Place HOFFY bacon-wrapped hot dogs on a sheet pan and set under the grill/ broiler, and cook until bacon is crisp and fully cooked and hot dogs are heated through, about 6 minutes, rotating the hot dogs several times to evenly cook the bacon. 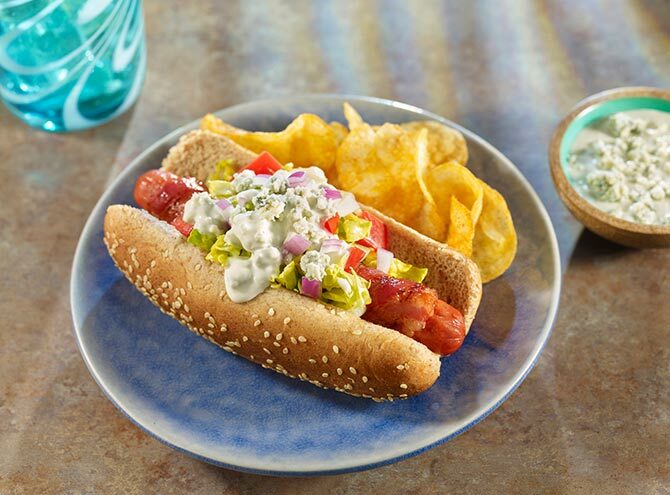 Place a bacon wrapped dog in each bun, spoon on some blue cheese sauce and crumbles, red onions, tomatoes and shredded lettuce.